I had used this mascara in the past quite frequently and had drilled it in my brain that it was actually quite good. If you remember Glamour magazine was giving some away free, so that was the time I stocked up and only recently have been giving it some love. What do I think of it now? The brush is still massive, :) I don't think as highly of it as much as I used to. I applied it today, and it just felt like it did nothing, blah! I was actually skeptical in thinking I got a dodgy tube, but no... all it does is coat the lashes with a very thin black film, it doesn't make them thicker, longer or volumise them in any way. The only good thing about it, is that it doesn't clump, so if you have naturally gorgeous thick lashes then this would make a good everyday mascara. But for me? No. In conclusion, if you want WOW lashes, then I wouldn't invest in this one. 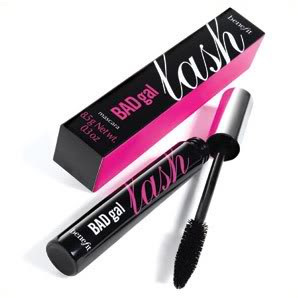 Photo: A few generous coats of the Bad Gal lash. What mascara do you recommend for WOW lashes? So far, my two favourites are the YSL Faux Cils, but it clumps. and the Chanel Exceptionnel - Amazing. Check my review here. I disliked this aswell, like you said it was 'blah' and did nothing apart from make my lashes darked. I also disliked the vibrating one by maybelline. I really recommend MF 2000 calorie, and lancome hypnose! I used to like Bad Gal Mascara and used it in Blue but after a while I realized that it wasn't anything. I also love YSL Faux Cils but my HG at the moment, and am on my 3rd or 4th tube now is Makeup Forever Smoky Lash. Absolutely amazing. I know it's almost impossible to get in London but if you can get, am sure you will love it! My fave is ysl faux cils too, unfortunately it dries out fairly quickly due to the formula. A little tip - Once a week, after use, wipe the brush with a clean baby wipe, make sure there are no fibres left on the wand from the wipe and then sanitize with alcohol. Let it dry for a few mins and then insert the wand back in the tube. The mascara won't dry up as fast if you do this. I completely agree with you. I had a sample as well from Bad Gal and I am happy I didn't spend my money on it! I also bought it thinking it would be great! Really dissapointed though, it literally just painted my lashes black! It refused to lengthen, volumise or curl..! Such a shame! My favorite mascara at the moment is Diorshow Blackout! LOVE IT! @nefertari lucky u didnt invest in the full size, samples are great, us girls should always get samples before we splurge! @with freckles and love, i love diorshow too! I love Maybelline Lash Stiletto, so so patent black & fluffy. I'm currently trying to finish the bronze tube of Rimmel Glam lash it well meh ok. I've never invested in a expensive mascara since I splashed out on Lancome Virtuose, one of the poopest mascara in the world. I quite like Bad Gal, made my eyelashes look really thick. My HG spectacular lengthening and thickening mascara is the original Diorshow. Pity its so expensive! I still havnt tried my badgal lash from glamour..i have so many mascaras to go through its ridiculous! I usually tendto stick with Bad Gal, however I already have extremely thick lashes. I love fresh firebird when paired with supernova, they are definitely my go tos, as well as Urban Decay's new Skyscraper mascara. For thick lashes, I really like my CG lash blast. Also NYX doll eyes mascara is quite good. My friend said I looked like I was wearing falsies when I wore the doll eye mascara, and I have spare short asian lashes, so that says a lot. I love Prestige's My Biggest Lashes, one coat = horrible clumpiness but two coats = heaven in a bottle for lashes. It thickens and lengthens and it makes me look like I'm wearing falsies, plus it's only about £5. I used to like that mascara, but I got in to Dior & loved it better..However, the less expensive kind I get is either L'Oreal Voluminous or Avon's Supershock for a thickening mascara. I was bought Bad Gal as a gift and although it makes me feel very ungrateful, it is terrible! The brush is too big and too much effort for little payoff. The all-time best for me is Max Factor Masterpiece Max. Check you out showing off your new longer lashes. I completely agree with your review, just not wow at all! The only wow mascara I 've ever used is the Exceptionnel, I think it might be my HG one (although I 'll keep looking for a new one)!!! Bad Gal Lash is a nice mascara, I quite liked it actually, but then again, I did use a million coats of it, lol (maybe why I liked it)! great review! Great blog! You are gorgeous! btw, your lashes really are getting longer! I had this mascara and I thought it was lovely, really smooth to apply and did not smudge. I would definately buy it and I am very fussy about my mascaras. I never had this mascara, so can't really say anything, but right now I really love MUFE Smoky lash and Dior Iconic. Totally agree with you about the Badgal - you would think it'd be packed full of volume and thickness looking at the packaging and brush - what really annoys me is the fact that i ended up with panda eyes a couple of hours after I'd applied it... I kind of forgot about it for a couple of years and then picked up a new tube with the magazine offer a few months ago, tried it once and remembered why i hated it so much! But yeah, god bless YSL! I am in the process of finding something that will last abit longer in the tube before my Lilash results start showing! Bad Gal was one of my past favorites, now...same thing, no thicker lashes. Unfortunately I have 2 tubes because I loved it so much. Lately I'm LOVING Dior Show Extase! And P.S. Giorgio Eyes to Kill is OVER RATED don't waste your money!Too Faced Lash Injection was also one of my favorites, but recently I bought two sample sizes and thought maybe they were just dried out so I got the larger siz (silly me) and just didnt get the same results, I dont know maybe my eyelashes have changed and I have new needs now! But I have went back to MAC Fast Zoom Lash and the Dior Show, Extase. By now I just could have paid for LiLash and had longer lashes!! !